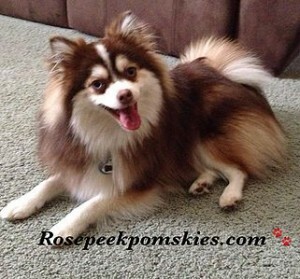 A 50/50 Pomeranian husk mix means the pomsky is 50% husky and 50% Pomeranian. This occurs when a pure Siberian husky is bred with a pure Pomeranian. This is the most common breed of pomsky. The 50/50 mix has moredistinguished husky features than the 25/75 mix and fully grown a 50/50 pomsky typically ranges in size between 10 to 15 inches tall and weighs between 20 to 30 pounds. A 25/75 Pomeranian husky mix is 25% husky and 75% Pomeranian. This occurs when a 50/50 pomsky is bred with a pure Pomeranian. The 25/75 Pomeranian husky mix has much more distinguished Pomeranian features than the 50/50. This breed will be smaller and tends to be around 10 inches tall and weigh between 10 to 15 pounds. All breedings are done with a female Siberian husky and a male Pomeranian. PCA requires all approved breeders to use artificial insemination, rather than natural breeding, as natural breeding would be dangerous and ineffective. How does this relate to the generation of a Pomsky? I know that an F1 is a 50/50 but was not aware that an F2 was a Pomsky bred to a Pomeranian. How then does it work if a breeder is saying they offer F3 pomskies? Are they a scam by your knowledge? An F2 pomsky is the offspring of two F1 Pomskies bred to each other. An F3 pomsky is a second generation Pomsky when two F2 pomskies are bred together. It’s possible that a breeder could have an F3 breed, but unlikely because the pomsky breed is so young. Do you want us to take a look at the breeder for you to see if it’s a scam? Simply reply back with the URL of the breeder’s website and we’ll take a look. 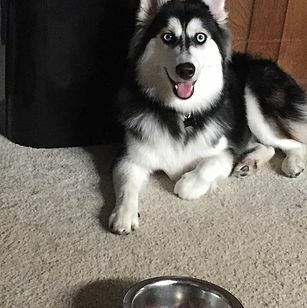 when a 25/75 breeds with a siberian husky what is the expected outcome and characteristics?